The nontoxic grass snake has round pupils, nine large head-shields and strong-stemmed dorsal scales. in Central Europe, it reaches no more than 1.5 meters in length, and is coloured with greenish-ash-brown toney. Another of its distinctive characteristics are its two bright, dark and half-mooned-shaped spots on the on the sides of its neck. 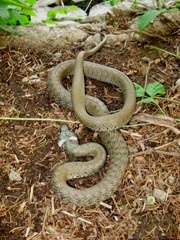 The Grass Snake’s abdominal staining is usually dirty-white with dark spots. The smooth snake’ slender body, covered with smooth scales, usually varies in colour between brown or grey tones. 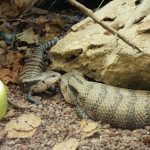 This Austrian snake (Coronella austriaca) can grow up to be to a size of 70cm (or even 80cm, in exceptional cases). Its head, slightly removed from its neck, denotes a u-shapped figure on its upper side, with a dark strip running from its nasal hole into the neck region. Usually, one or two rows of double outlines appear to fuse into a zigzag line when creeping, thus increasing the risk of confusion with the poisonous viper. The Aesculapian snake (Aesculapius), is the largest domestic snake, with a maximum length of more than two meters. 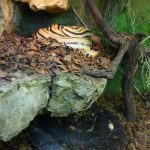 The snake is characterized by its narrow, slightly elongated and oval head, and by its pointed tail. The snake presents 9 large signs on the head, a round pupil and an absence of defang that makes it into a harmless snake. Furthermore, the typical smooth dorsal scales are clearly developed and thus are a useful climbing aid for these land snakes. The top of the body is largely uniformly light or dark brown, occasionally olive, and are slightly lighter in the anterior third. The lateral dorsal scales often bear small white lines at the edges. The entire underside is usually spotted with a yellowish-white tone, exceptionally, they can also be dark. The dice snake is specially adapted for water life (Natrix), with upwardly directed eyes and nose openings. The usually 60 to 90cm (rarely more than 1m long), slender, narrow-headed snake is light- or dark-olive-brown to grey with different and clearly pronounced dark drawings of square spots (also known as “cubes”) in mostly four longitudinal series. The neck is doted with a V-shaped spot. The abdominal side looks, as a general rule, bright with dark spots (or on rare occasions, longitudinally striped or completely black). 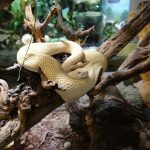 The Nose-Horned Viper is a poisonous snake, usually with a length of 60 to 80cm and with a relatively plump body, a short tail, and a clearly arranged rear triangular head. 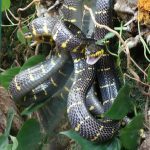 This snake carries with itself numerous small headed-signs and the very distinctive scaled “horn” at the tip of the snout. The viper’s eye colour has a perpendicular split pupil; the trunk scales are keeled. The colour of the body shows different tones of grey (in males) and in females, albeit less distinctly, brown or reddish brown. In the case of the Adder, the viper’s typical characteristic features (short tail; compact trunk; detached, triangular and angular head; numerous small shields on the head side) are much less pronounced. The Adder essentially consists of five larger and many smaller plates. The head drawing entails a more or less complete V- or X-shape at the back and a dark longitudinal band on each side of its head. The body can reach a length of 50 to 75cm (in exceptional cases, females can reach a length of up to 85 cm). 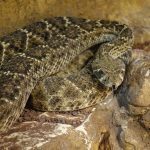 Like the Nose-Horned Viper, the Adder is also drawn with a dark zigzag band on the back and is thus distinctly dissimilar from the domestic non-poisonous snakes. Relatively often, black specimens appear (the so-called “Höllotter”), which are more rarely coloured in reddish brown (“Kupferotter”) tones. The Carinthian reptiles. Carinthia II, Natural Science Association of Carinthia, Klagenfurt.